Major General Maurice Rose, who was born in Middletown, earned a Purple Heart during World War I and climbed the army ranks during World War II. He led a 100-mile drive through central Germany, the longest one-day drive by any Allied unit in the war. One day later, General Rose was shot and killed in the German city of Paderborn. He was the highest ranking American General killed by enemy action in the European theater. 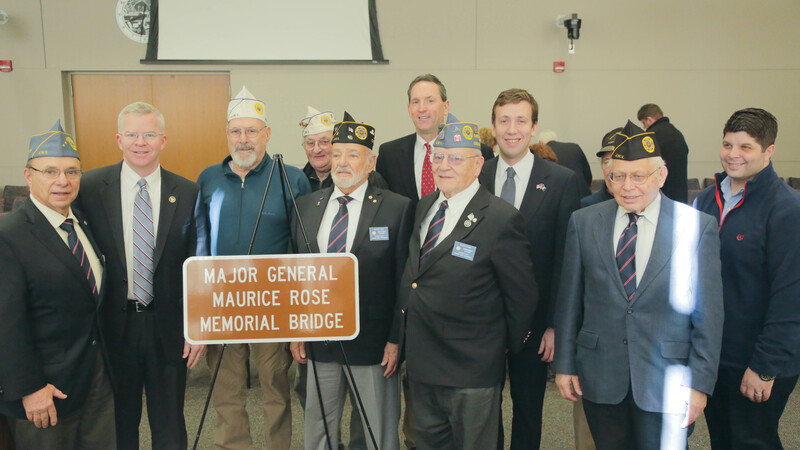 This bridge will be central to Middletown’s riverfront redesign and will ensure that as we move forward with this project we do not forget that our veterans are the reason we are standing here today. Before the new year began, I also toured the new OASIS Center at Middlesex Community College with Department of Veterans' Affairs Commissioner Sean Connolly. Each public college in the state has an OASIS (Operation Academic Support for Incoming Service Members) Center which provide important support services for returning veterans. Our servicemen and women deserve support when they return home and it is important that we honor them with any help they may need.